RORY MCILROY WILL face an unwanted reminder of last year’s Masters misery when he tees up alongside Angel Cabrera for the opening two rounds at Augusta this week. Cabrera was McIlroy’s playing partner in the final round last April when the Hollywood youngster fluffed a four-shot lead and capitulated completely, shooting 80 to finish in a tie for 15th place. The two have been drawn to play together again on Thursday and Friday alongside the big-hitting American Bubba Watson. Padraig Harrington will play alongside world number five Steve Stricker and 2009 Open Champion Stewart Cink for the opening two rounds. An dismal run of form has seen Harrington drop to 96th in the world, with the Dubliner relying on his exemptions as a three-time Major winner for his place in the select Augusta field. Darren Clarke, winner of the Open Championship last summer, will play alongside Masters veteran Fred Couples and Japan’s rising star Ryo Ishikawa on Thursday and Friday. 2010 US Open champion Graeme McDowell has been drawn alongside Louis Oosthuizen and Mark Wilson. Play gets underway on Thursday afternoon, with the first of the 32 groups due to tee off at 12.50pm Irish time. 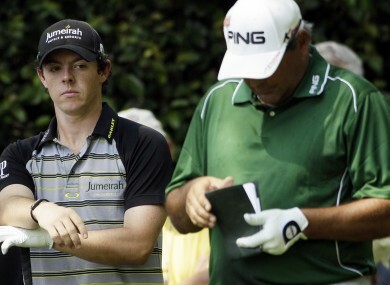 Email “I've seen this one before: McIlroy and Cabrera reunited at Augusta”. Feedback on “I've seen this one before: McIlroy and Cabrera reunited at Augusta”.